Not long ago, I was writing about music banned in Zimbabwe. Like slavery and poverty and violence and fossil fuels, the suppression of "objectionable" songs and artists seems like something we should have transcended long ago. But it's not yet so. 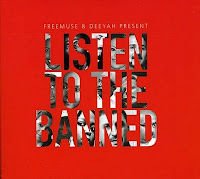 To appreciate the widespread nature of the problem, you need look no farther than a wonderful new compilation called Listen to the Banned. The album is presented by Freemuse, an organization promoting freedom of expression worldwide for musicians and composers, and Deeyah, a Pakistani singer, composer, filmmaker, and activist. Like the best for-a-good-cause compilations, you can listen to Banned not out of guilt, but because it's got some fantastic music. You'll likely recognize a number of included artists, such as Persian singer Mahsa Vahdat, Lebanese oud player Marcel Khalife, Zimbabwean singer Chiwoniso Maraire, Ivory Coast reggae star Tiken Jah Fakoly, and Western Saharan singer Aziza Brahim. Cameroonian musician Lapiro De Mbanga, whose song "Constitution Constipée (Constipated Constitution)" became an anthem of popular protest and got him charged with "inciting youth unrest." He is currently serving a three-year prison term. Haroon Bacha fled Pakistan for the USA in 2008, leaving behind his wife and two children. His songs of "peace, tolerance and resistance to war" were not accepted by Pakistani Taliban: "They used to come very frequently back home, just telling me to stop music, or else I would be killed and my family would be. ..."
Farhad Darya was one of the first musicians heard on Afghani radio after the fall of the Taliban (and their ban on music). He resides in the USA, but has returned to Afghanistan to perform. At a concert September 15 in Herat, Afghanistan, a motorcycle bomb exploded, injuring at least 13 fans. If you love global music, you should be concerned about the trend of banning music. It happens worldwide for a variety of reasons, many of which are documented at Freemusepedia. There's a lot of music out there that I don't like, and that I even think may be damaging or dangerous. I choose to ignore it rather than call attention to it by trying to get it banned from schools or libraries or concert venues. Until governments and terrorists do the same, we need compilations like this and organizations like Freemuse to remind us about these artists on the front lines.